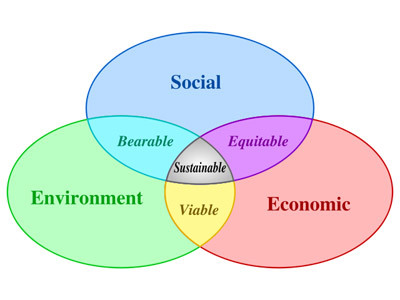 Many times if people have heard the term sustainable before, the thought that comes to mind is the environment and maybe climate change or deforestation. At one point I googled the definition of sustainable and found out the definition according to Wikipedia was “the ability to endure.” If we break that down a bit, obviously if something harm’s the environment it will eventually run out of resources or cause other problems that no longer allows the Earth to function as needed. This is not sustainable. If you look at the above graphic though, you see that sustainability isn’t just the environment. It has economic and social components as well. For today I am going to focus on the economics because finances have become a focus for me the last few years. If we hop in the way back machine and go to maybe 10 or 12 years ago, I was trying to get my life in order after a breakup. I was trying to plan a birth and time off work without another person to help pay the bills. It was a situation where I would lose my job because I was through a staffing agency and didn’t qualify for any sort of leave as a temp. I needed to have my bills paid. I needed a plan to feed my kids. I was also at a point where I had racked up debt trying to keep us afloat when we had been out of work during my first pregnancy and a bit after that. I started trying to pay off debt. I had read Dave Ramsey’s Total Money Makeover and it made sense. Get it paid off and then move on. That made sense. At least until I hit the recession a couple years later and chose to go back to school when I couldn’t get a job. In case you are wondering- debt for a degree is not recommended. I know I was making the choices that were best for my circumstances at the time, but man has it added stress ever since. That is because it wasn’t sustainable long term. In fact, I should have stopped a lot sooner than I did from a financial perspective. And at least my brother would argue I need to finish my Master’s since the classes are all done and I just have to write the thesis. But I digress. The point is, you can’t live off loans forever and expect it to meet that definition of sustainable as a plan that is able to endure. Eventually you can’t take out more loans. You can keep them from coming due by continuing to take classes, but that means another regular outlay of money to pay for your tuition. And since if they are federal loans you can defer based on income that is probably a better option if needed. Eventually though you need a longer term plan. How are you going to be okay after retirement? Do you have pensions or maybe retirement accounts you can save in through work? Can you make ends meet right now? I think there are a few foundational items needed in your arsenal if you are going to be sustainable when it comes to your personal finances. The first is that you need a spending plan or budget so that you know where your money is going and what you have coming in. This may be on paper, in a spreadsheet, on an app. However works for you is fine. Personally I am using an old version of YNAB (You Need A Budget) because the new subscription model wasn’t sustainable in my current moment with my goals. Before that I used a spreadsheet. The problem that YNAB solved for me when I first got it was that my spreadsheet would lay out how much I had in each category…. But if I spent more or bought something else entirely it wasn’t accounted for. Maybe if I had ever mastered using a checkbook register for debit card purchases it would have worked. The second key is that you need to get your actual income and outflows to match or preferably be so that you are spending less than you earn. Needless to say, if you have more going out than coming in you will eventually run into problems. You only have so much space in your credit card spending limit, you only have so many people or places to borrow from, and eventually the answer will be no. And then the people you owe money to will have their hand out wanting to be paid back. Which brings us to the next paver on this financial path- pay off debt as necessary. These days I am spending a lot of time in the realms of FIRE…. Financial Independence Retire Early. I started out learning from Dave Ramsey and Total Money Makeover early on, but there are many differing opinions on debt when it comes to FI. Generally speaking, if you have credit card debt that you are not paying off in full every month, you need to work on getting this taken care of. If you have any debt above the amount of inflation(in the US it is somewhere between 2 and 3%), you need to work on getting it paid off. This might be happening at the same time as future steps though. The next thing to figure out is what you need to sustain your lifestyle. Hopefully you were able to pare down if need be and you are currently living within your means. This would be the ultimate economic sustainability, to just have the money to live even if you didn’t go to work in the morning. Since I am not the greatest at explaining all of these concepts I am going to suggest you go check out Mr. Money Mustache’s article about The Shockingly Simple Math of Early Retirement. If you want a quick equation though it is 25 x Annual Expenses = Financial Independence. This gives a high probability of not running out of money in retirement before you die. After that you have hit financial sustainability. Even if you add some padding into your numbers to mitigate any future changes or to give yourself extra padding, the end product is a financial life that will endure and keep you going even after you are done working. A great place to pick up actionable tips to help get you to FI is over on the ChooseFI podcast if you want to hear more. I may have binge listened to many episodes while at my last job….